Schooling has resumed at Shaleng village near Taung in the North West, after four weeks of disruptions. Community protests have prevented them from attending school. Demands include a road, a new school and RDP houses. 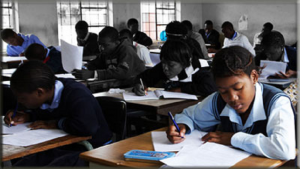 A grade 11 pupil, 19-year-old Olibile Arone, says that they are concerned about falling behind. The North West Education Department has pleaded with the community to stop disrupting learning. The community has agreed on condition that two new schools are built in Shaleng. John Semeri, school principal, says a priority for the school is making up for lost schooling. Residents say they are tired of voting and not receiving services. “We don’t have roads, schools, water and a clinic. That’s why the community took the decision of stopping children from going to school,” says a resident. The community has threatened to disrupt schooling again if its call is ignored. The post Schooling resumes in Shaleng in the N West appeared first on SABC News – Breaking news, special reports, world, business, sport coverage of all South African current events. Africa's news leader..